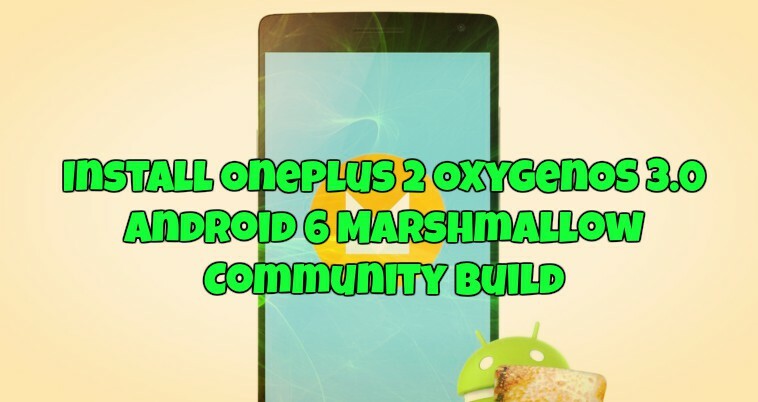 Oneplus 2 OxygenOS 3.0 Android 6 Marshmallow Community Build is available for the download. Oneplus 2 users who are waiting for the Android 6 update now install this OxygenOS 3.0 Community Build and test the latest Marshmallow update on the phone. The new OxygenOS 3.0 is based on the Android 6.0.1 Marshmallow and comes with lots of new feature like New OnePlus Camera UI, New wallpaper picker, Shelf UX has been improved, General system performance improvements, Fingerprint performance improvement, and March security patches. If you are the oneplus 2 users then here is the guide which you can follow on your phone and update the same with OxygenOS 3.0 Android 6 Marshmallow. All credit goes to Oneplus Plus forum member Naman Bhalla, who created a detailed guide for Installation Instructions and all. The process is simple and all take a few minutes to complete the whole task. The best part of this guide is that you can install the update without losing your data. But We ALWAYS recommend backing up all your important personal data before flashing. So do take the full backup of your phone and read all the instructions very carefully and follow all the steps very carefully. Here we are showing you two methods. First, one is for those users who is on stock recovery and non-rooted oneplus 2. And the second method is for the rooted user with TWRP recovery. Step 1. Download OxygenOS Zip from here and put Zip file anywhere in the phone Internal Storage. Step 2. Now Switch off your Phone. Step 3. Now boot in recovery mode. Reboot into recovery by pressing power+volume down button . Step 4 Once you are on stock recovery. Select English Language. Step 5. Select Install from Local. And browse the ZIP file that you save on your phone. Step 6. Select the Zip and click on Install. Step 7. Now the installation process will start and it will take some time. Step 8. Once completed. Reboot. Strep 2. Now download the Modified TWRPrecovery.img from here . Keep it anywhere in the Internal Storage. Step 3. Now Boot your phone into TWRP Recovery. Step 4. Go to Wipe -> Advanced Wipe -> Select Dalvik, System, Cache -> Swipe to wipe. Step 5. Now go to TWRP Home. Select Install > Select OxygenOS Zip > Swipe to Install. Step 6. Go to TWRP Home. Select Images button at the bottom right. Select recovery.img . Select Recovery. Swipe to flash. Step 7. Go to TWRP Home. Select Reboot -> Recovery. Wait for it to reboot into recovery. Step 8. Reboot into System. Done. Now your phone is running on the OxygenOS 3.0 Android 6 Marshmallow. I have to go back to Oxygen OS 2.2.1. but do not know how to do. Could you make a step by step list how I can go back to previsious OS?